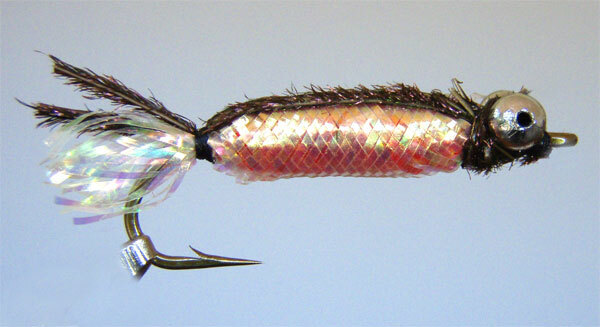 This fly, designed and tied by Kevin Cole, works well in estuaries. Weight A few turns of lead behind the eyes under the wool body if required. 1) Wrap the red wool or chenille along the length of the hook forming a slightly tapered body from the barb to the head leaving enough room for the eyes. Tie off the thread. A lateral line can be drawn with black felt tip pen onto the wool if desired.2) Cut a piece of mylar tube slightly longer than the length of the hook. Remove the core and slip over the body. 3) Tie a few wraps of thread around the mylar just in front of the wool body. 4) Tie in the bead chain eyes at this point with figure of 8 wraps. 5) Just behind the eyes tie in 5 strands of peacock herl. 6) Take 1 strand and wrap it around the tying thread a few times. Then wrap around the eyes forming the head. Whip finish just behind the hook eye and tie off. 7) Wrap the thread around the mylar tube above the hook barb . Tease out the mylar behind this point forming the tail. 8) Pull the 4 remaining pieces of peacock herl over the top of the body, secure with a few wraps of thread and tie off. 9)Trim the herl and tail to length. Fish this fly with a sinking line into the wind using a long strip followed by a pause. This causes a jigging action and simulates a small fish struggling in the current caused by the wind.